Don’t get me wrong, I’m all for having a cookout to commemorate the signing of the Declaration of Independence, but I just don’t see why people feel the need to turn everything we eat red, white, and blue like a migrant leprechaun run amok. 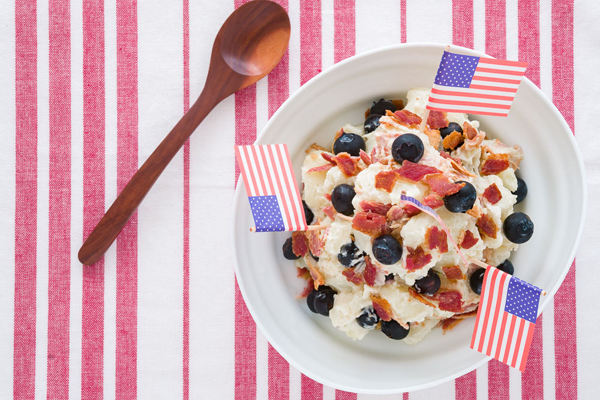 Thankfully nature has left us with plenty of foods with a patriotic hue, like potatoes, blueberries and bacon (well okay, the last one isn’t exactly natural, but I can’t think of many ingredients that are more American). 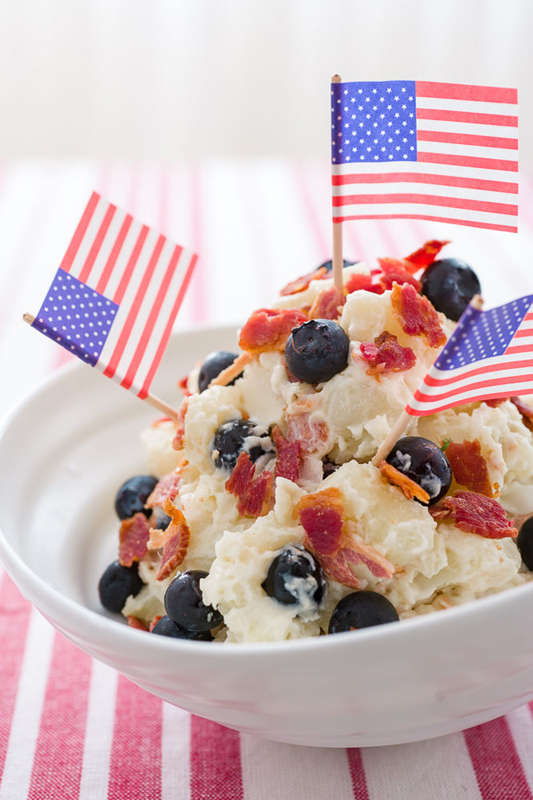 This red, white and blueberry potato salad, doesn’t just look the part, it actually tastes great as well. 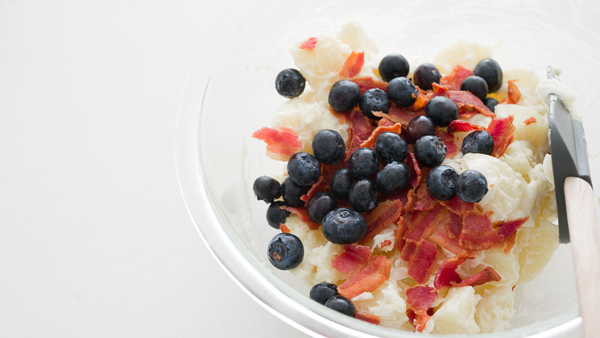 With creamy white potatoes studded with sweet blueberries and salty bacon, it strikes a pleasant balance between savory and sweet that will keep you going back for more. 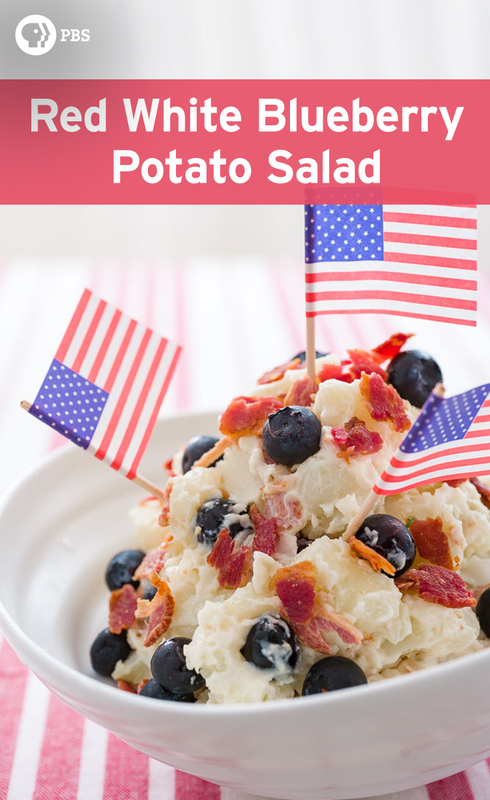 To make the salad a little more interesting I’ve included some onions that are salted and rinsed to take off the pungent edge, while giving them a crunchy texture that’s the perfect compliment to the crisp bacon, juicy blueberries and tender potatoes. Whether I’m making mashed potatoes or potato salad, I like to boil my potatoes whole, and then peel them after they’re cooked. While it does take a bit longer, this keeps the potatoes from getting waterlogged and soggy, giving your potato salad a nice texture. Wash the potatoes and put them whole into a large pot and cover the potatoes with 2 inches of cold water. Bring the water to a boil and then lower the heat to maintain a bare simmer until you can pass a toothpick through the potatoes. 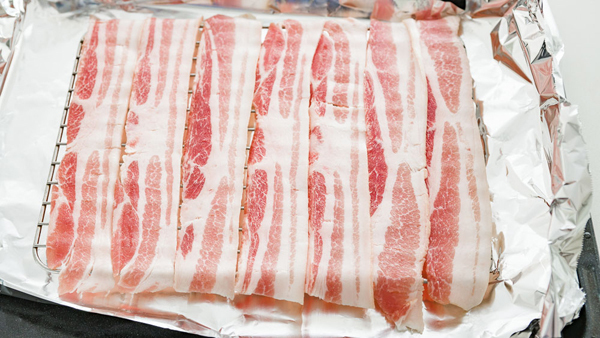 Meanwhile, place a cooling rack on a baking sheet with a rim and then lay the bacon out onto the rack, in a single layer. Put the sheet in the oven and turn the heat onto 400 degrees F. Bake the bacon until crisp (about 15-20 minute). 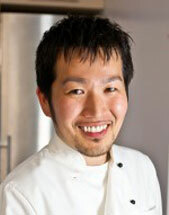 Watch the bacon closely towards the end as the difference between crisp and burnt is a few seconds. Drain the bacon on paper towels and let it cool. 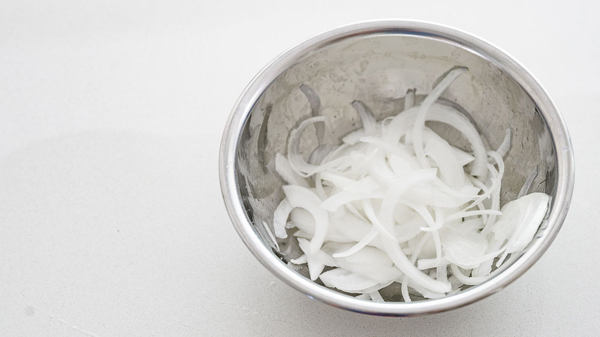 Put the sliced onions in a bowl and add about 1/4 teaspoon of salt. Let the onions wilt for about 15 minutes. When the onions have wilted, give them a massage with your hand to coax out some water. Rinse the onions and then squeeze as much water out of them as you can. When the potatoes are cooked, drain, and let them cool enough to handle. Peel the potatoes and then chop them up into big chunks and add them to a bowl. 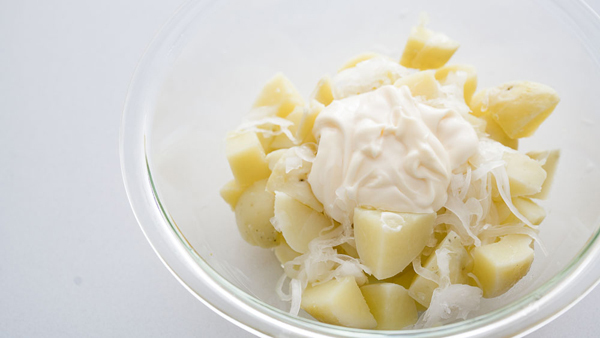 Add the mayonnaise, apple cider vinegar, 1/2 teaspoon of salt and onions to the bowl with the potatoes and mix well to combine evenly. Crumble the bacon and add half of it into the bowl with the potatoes. Add half the blueberries and stir to combine. 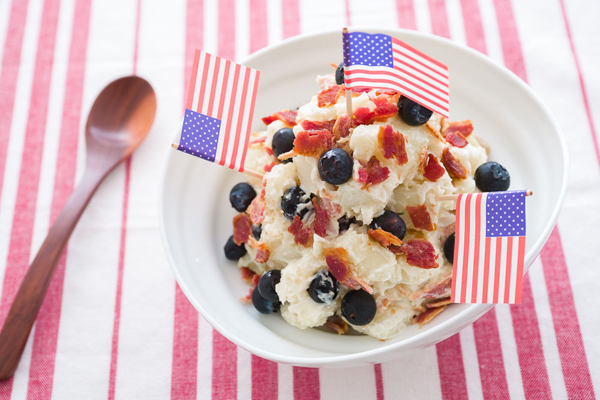 Plate the potato salad and then top with the remaining bacon and blueberries.